EA just released a new patch, adding Act 1 craftables back! As most of you know by now, every update not only brings new content but also changes to many other aspects of the game. From prices to appearance, task lengths to requirements, any part of the game is subject to change and many changes affect every player. Follow us right after the jump for the list of all of the changes. Act 1 craftables are craftables again for Act 2. Crafting currency rewards from friend visits tripled. The event ending video “The End of the Beginning” was added. Presents given every 24 hours doubled from 5 to 10. Giant Snow Globe’s jobs not working properly if a skin is selected was fixed. My Kang and Kodos no longer go to their Victorian Saucer when they do their 16 hrs Chortle. Anyone else having the same issue? I hope they change it back. This was changed because not everyone has the victorian ufo. There is a known visual issue with this task, overlapping. Dont think they will change it back. 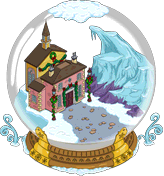 Burns doesn’t work in my giant snow globe in either Ebenezer or Witch skin unless I place the globe on bare land with nothing behind it. Presently I’m keeping monorail track behind mine so I’ll have to live with not seeing Burns animation….whatever …he’s usually doing laps in the money pool anyway! did you try storing him or the globe? Yes Burns is earning event currency now…I was thinking more after the event…. I haven’t tried storing yet….Burns is on 12 hr mistletoe job….but I will try that later and let you know. I tried storing Burns and the globe but it seems to be monorail that’s the problem. Storing had no effect so I tried placing the globe in a blank area and placing a few items behind it to see if Burns is affected. Nothing affected Burns animation except monorail (placed just behind globe). In the error Burns appears to be behind the globe instead of grouching on the roof….I can just see his arm. I guess it’ll be fixed eventually. Can I be a game tester for EA! What’s the update on the Gil Starter Pak? I noticed a lot of posts saying people weren’t getting it. It never opened for me. I got the dialogue about Homer dropping donuts into a pit (his stomach) and I got the snow globe offer. Is the starter Pak linked to opening the Better Not Cry quest line? Thanks. Anyone have a link to the mountain lodge or what it is and how long it takes to get it? When did the bauble payout per tap increase to 3 from 1? Since when did they have event ending videos. Been playing for years and I’ve never seen one! Sorry for going off subject, but when do u think they will offer the donut special? 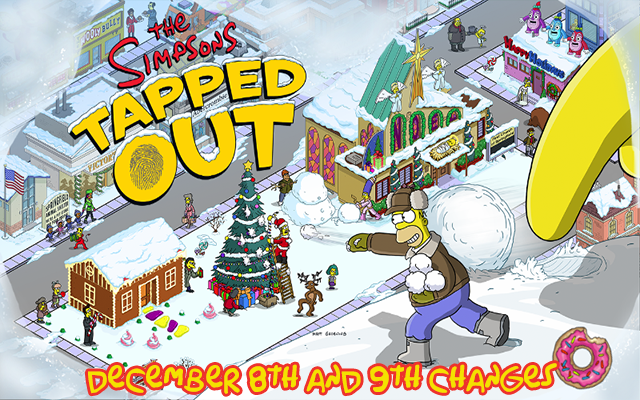 Next Merry Christmas from TSTO Topix!